We’ve seen a lot of excitement around the custom visuals area since we released it in October, 2015. We set out to make it really easy for you to show your data in the unique way that makes the most sense to you and your audience. We started by adding custom visuals to reports and we’ve been amazed at what Power BI users have done with that capability. Today, we’re excited to add the ability to pin custom visuals to dashboards in Power BI. This feature was highly sought by our community and was sitting at the top of our “Hot ideas” list on https://ideas.powerbi.com until we just closed it as completed. We hope you’ll send us tweets of all the cool dashboards you create with your custom visuals! We’ve strived to make pinning custom visuals as easy as possible. So we made the UI and workflow exactly the same as for our built-in visuals. You’ll now see a ‘pin’ icon at the top of custom visuals and when you click it you’ll be able to pin the custom visual to a dashboard of your choosing. We’ve also received requests from many of you to make enabling custom visuals easier. With this release we’ve made it a lot better. Now when you press the “enable custom visuals” button, it will remember which visuals you accepted and won’t ask you again for those visuals. This behavior is available for your dashboards and reports. 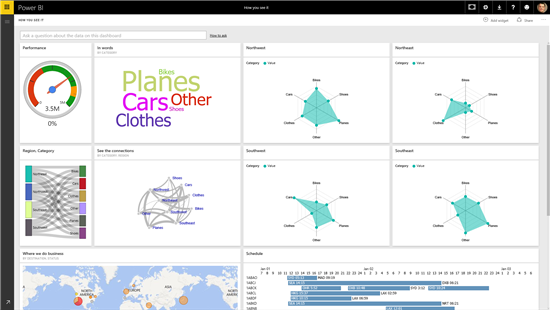 Of course, if the report or dashboard changes with new custom visuals added or a new version of the visual, Power BI will prompt you again. While this could be a slight annoyance, we want to make sure that only the visuals you trust are automatically loaded. This change is now in PowerBI.com and we’re looking to bring it to Power BI Desktop as soon as we can. We’re glad to be able to start 2016 off with this feature and hope you find it very useful. If you don’t know which custom visuals to use, try the ones at https://visuals.powerbi.com, there are 31 to choose from!